The 2014/15 Sun Peaks Expansion is underway with a number of exciting changes and additions to the popular, growing four-season resort. Summer Sun Peaks improvements includes a refurbished tennis court surface, upgrades to many of the downhill bike trails that already make the Sun Peaks one of the top 10 bike parks in the world, and new and/or improved cross-country ‘free-to-ride’ or lift accessed mountain bike trails. And also, perhaps one of the Best Sun Peaks hotels, the Delta Sun Peaks Resort, changed their management from the Delta chain to a local, in-house team and rebranded as the Sun Peaks Grand Hotel & Conference Centre. And as we ‘segway’ into our winter Sun Peaks expansion section, we will also mention the new Segway Tours that are starting up in the summer of 2014 – the popular stand-up electric personal transporters can now be found motoring on the trails around Sun Peaks Resort. Sun Peaks Improvements - More Winter Fun in the Sun! Not being content with being the second most popular resort in Canada and just the second biggest ski resort in British Columbia, the long-awaited expansion to the Sun Peaks skiable terrain is now underway. With over 500 acres of exciting new in-bound ski area being added, their 4,200+ acres of inbound, ski-able terrain will make Sun Peak the resort with the second biggest ski area in all of Canada! And experienced skiers will love the new runs! The previously undeveloped area on Mt. Morrisey in between the beginning of Delta’s Return and Back in Time, both Blue Runs, will be opened to include expert level runs similar to the popular Double Black Diamond ‘Static Cling’ and Black Diamond Agitator runs in the popular West Morrisey area. 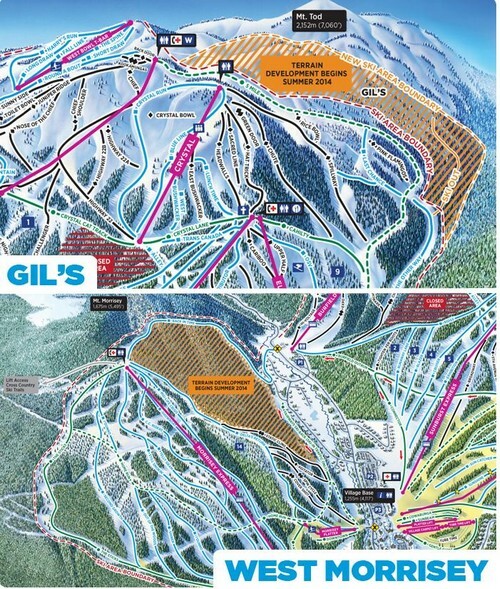 And the boundaries that previously ended at the popular backcountry area known as Gil’s over at the top of Tod Mountain will be expanded and skiers will see the area’s vertical double with the creation of a lower ski out back to the main ski runs. The Gils Sun Peaks offers some of the best Sun Peaks snow and great off-piste skiing. Exciting new runs in a safe, expanded, off-piste avalanche controlled area – sweet! See our Mt. Morrissey page for the latest updates. Also coming soon is a new, NHL-sized hockey rink with full hockey boards and an extended playing season thanks to the addition of new ice making equipment. As of the 2015/16 ski season, Sun Peaks was still reviewing to find the best Sun Peaks location for the skating rink (Operating as of fall 2016). Future plans include the addition of a cover as well which will be great during the amazing dumps of fresh pow! The new skating rink was to be located just east of Parking Lot 5, very near our Best Sun Peaks condo and Trapper's Landing townhouse, and the free kiddie toboggan hill and right across from Settler’s Crossing. However the final location was parking lot 4, right beside the Sun Peaks Community Pool, and was up and running as of fall 2016. Exciting times ahead at Best Sun Peaks – come on up for an awesome family vacation!